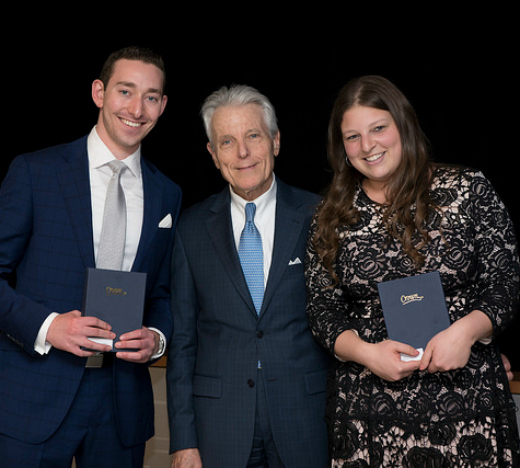 More than 350 students and faculty gathered at Citi Field on May 11 to celebrate the Sy Syms School of Business Annual Gala Awards Dinner. The event honored 26 student award winners and featured a fireside chat between Marcy Syms, president of The Sy Syms Foundation, and Michael Steinhardt, renowned investor and philanthropist, who received the Sy Syms Humanitarian Award in recognition of his technical practices in philanthropy and business and commitment to the welfare of the Jewish community and humanity. In his introductory remarks, Sy Syms Associate Dean Michael Strauss lauded the late Sy Syms for ensuring that the largest institution of Jewish learning would also have one of the best business schools in the country when he helped establish the school in 1987. “After 30 years, we are well, we are alive and we are thriving,” said Strauss. President Joel praised Steinhardt not only for his investment prowess but also his reputation as a philanthropist “who is not a donor but an investor who creates and nurtures,” citing his work with Hillel and the founding of Birthright. “His impatient love of the Jewish people always has him trying to figure out how to ensure that we move forward and remain a strong, committed people of purpose,” said President Joel. The event featured a touching video tribute to Dr. Moses Pava, the Alvin Einbender Professor of Business Ethics, who will complete his tenure as dean this semester. “My deepest gemul [reward] as a teacher, researcher and writer, has always been to marry business and poetry, and I leave you with my most cherished piece of advice, from the singer Leonard Cohen: ‘There is a crack in everything/that’s how the light gets in,’ ” said Pava. The highlight of the evening was an awards ceremony celebrating outstanding students and faculty. “In accounting, I found a profession that satisfied my love of problem-solving, and I am so thankful to my teachers for giving me this path to follow,” said Avigail Goldstein, of Highland Park, New Jersey, who received the Dean Harold Nierenberg Valedictorian Award and Henry Brout Award for Superior Scholarship in Accounting.